This latest qualifier event of the 2018 Mega Match This qualifier campaign brought with it a much cooler day than of late with a brisk breeze putting a decent ripple on all the lakes in use for the competitors taking part in this, the 21st qualifier of the 2018 series. With only a few qualifier events now remaining, the pressure is now on for anglers to book their place in this year’s grand final with just three places left available. The competition got off to a slow start for most of the competitors, but the venue eventually kicked into life and produced weights in excess of 200lbs for the top four (4) anglers on the day. In total thirty two (32) other weights over the ton were recorded producing an excellent match which lived up to the venues reputation for producing extremely good weights making it impossible to tell at any stage during the match, who the likely winner was going to be and where the winning weight would come from. Wayne Shepherd with part of his winning 229-03-00 which sees him through to his first Mega Match This Grand Final at Maver Hayfield Lakes. Winner on the day from peg 24 on Cedar was Tackle and Bates backed angler, Wayne Shepherd. With the wind blowing directly at him, Wayne opted to fish down his margin at just four (4) metres for the duration of the match with banded 6mm pellet on the hook whilst feeding micros over the top. Wayne caught steadily throughout the day to finish the match with a net of carp to 8lbs plus barbel for 229-03-00 to confirm his place in the 2018 Mega Match This final and British Pole Championships. Finishing close behind in second place with a weight of 224-04-00 was Matt Higgins (Matrix Bait-Tech LTB). Fishing from peg 18 on Beastie, Matt also had the wind in his face so opted to fish short at four (4) metres with banded 6mm pellet over micros to net carp to 10lbs to qualify for another appearance in the Maver British Pole Championship final. Third place went to Decoy Fishery Manager, John Smalley, who drew Cedar lake peg 7 on the opposite bank to the winner. 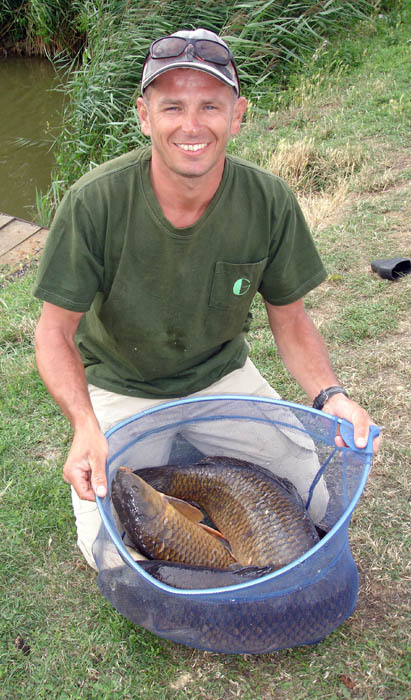 Again, fishing his margin all day using four (4) tins corn, four (4) pints of micros and two (2) tins of hemp, he finished the match with 221-01-00 to confirm his place in this year’s Maver British Pole Championship final.